Free Virtual Serial Ports is an user mode driver based software with Virtual COM port rs232 null modem cable emulator. Virtual COM port created in your Windows OS may be: Connected to a named pipe. Connected to a different virtual COM port, establishing a virtual serial bridge and emulating virtual Null-modem cable. Connected to input and output files. Application may open virtual Serial port and read data which is actually taken from the input file. Application may also write data to the Serial port which is actually written to the output file. Virtual Serial Ports architecture: Virtual Serial Ports Device Driver Device Driver operates in the user mode space. It implements functionality of the virtual serial port device. Virtual Serial Ports ActiveX Control Provides user with application programming interface (API) to install and manage virtual COM ports. 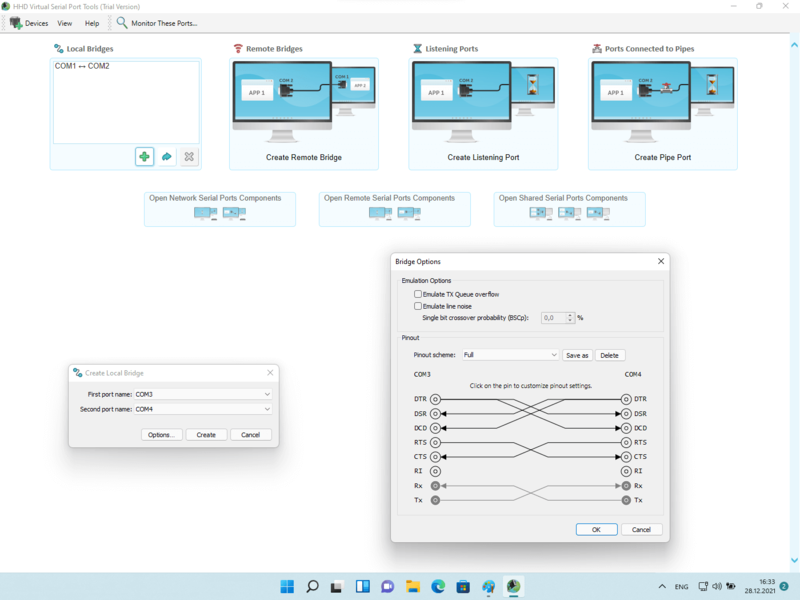 Virtual Serial Ports Configuration Utility ActiveX Control Application with simple graphical user interface which allows you to install and manage virtual serial devices in your Windows OS.